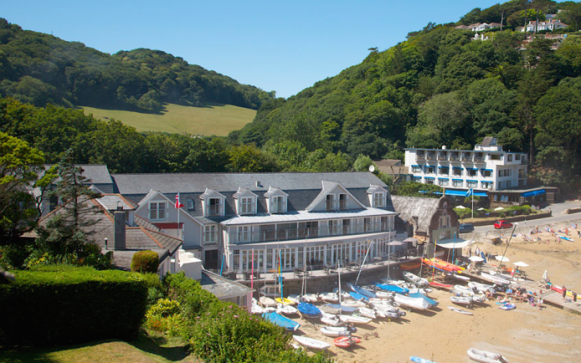 There has been a hotel on this site in South Sands Bay since just after the Second World War. This latest incarnation, with its New England interiors and luxurious suites and bedrooms, is arguably the best yet. Eat: The restaurant, with spectacular views over the bay, offers what you'd expect, namely top-notch fish and other seafood. Seafood specialist Mitch Tonks consulted on the menu. Dogs are not allowd in the restaurant, but they are allowed in the bar (where you can order from the same menu) and they are also allowed in bedrooms on their own. After a full day of running and playing on the beach, they should be too tired to get up to mischief, but if you want to eat in the restaurant, reception will also offer a free dog-sitting service. In the summer there's the chance to enjoy eating outside on the terrace (where your pooch is again free to join you). Several Beach Suites also have basic kitchens to allow for limited self-catering. Sleep: The hotel is extremely dog friendly and has 10 rooms available for dogs, including at least one room in each of its categories. Those rooms are room 5 (an Enterprise Room), room 23 (an Optimist Room), rooms 7, 17 and 21 (Dragon Rooms), room 12 (a Yawl Room). There are also four Beach Suites 31, 32, 34 and 35. If the budget will stretch the Beach Suites offer an amazingly spacious and relaxing space, often with access onto the beach (although South Sands is only dog-friendly out of season). There is a £12.50 a night charge for dogs, with a bed and a bowl provided. Walk: If you go out of high season, then South Sands beach is accessible from some bedrooms. Other local beaches are more dog-friendly all year round. There is also the excellent walking along the South West Coast Path. There are also some lovely walks in nearby Salcombe.